I’ve been doing some cyber housecleaning lately. That includes moving and reconfiguring various things ranging from the physical hardware components of my electronic “self” to the intangible binary ones and zeroes that combine in infinite combinations to constitute the vastness of my recorded experience. Just as an aside, as vast as that vastness is, it is but a drop in the bucket of my overall life experience. That is, what is held in my physiological, emotional and spiritual databases exceeds by many orders of magnitude my experience stored as electromagnetic ones and zeroes on electronic storage devices. But that’s not what this is about. Despite my cyber-life being a small fraction of my life overall, it is still a huge amount of what we understand to be data in the age of information. Moving it, reorganizing it, and ever so cautiously deleting much of it turned out to be all consuming, not just time consuming. Added to this task one must also consider the various and sundry virtual rabbit holes that demand to be explored… the adventure becomes almost real. For the last couple of hours I have been in one such rabbit hole. It used to have a name – it was once called the “Blogosphere.” Not unlike Alice’s Wonderland, this blog-world has many curious things in it. It is an old world, almost ancient when placed into its Internet evolutionary place. It is also an eerie, odd place. It is a place I once new very well, but like so much else of late, the Blogosphere is barely recognizable to me anymore. It is evolving and its ancient remnants are disappearing, disintegrating, decomposing. Even the name, “Blogosphere,” no longer means anything to those who were not there. And like it, we are disappearing, too. No, we are not generally so old yet to be physically dying off like the civilizations of antiquity, but with the new, we are abandoning - we have abandoned - the old. And all that data… That indestructible data that was supposed to be immune to the deterioration of time – no pages to rot, no ink to fade, instant, error free and precise replication. We created a form of data storage and transmission that would never fade away. And yet, the Blogosphere, like Myspace, Tripod, Compuserve, AOL, and the computer bulletin boards of the early Internet are not just fading from memory; they are fading completely, physically. That’s where this particular rabbit hole led me today. I was walking through the blog wasteland, pouring through old bookmarks – some almost ten years old now, and finding too much death, too much desertion, too much decay. The Blogosphere as I once knew it is all but dead, replaced now by “blogs” that are nothing more than any other website. I remember seeing it coming. I remember when adding links, pictures, sound, and other now very elementary objects to blogs took a considerable amount of know-how and effort. And I remember when progress came. It came slowly at first; we could “drag and drop” a photo into our text. Hyperlinks, imbedded video and advertisements came along and, like a snowball barreling down a mountainside, the “progress” could not be stopped. Soon, other platforms entirely replaced blogs and even mainstay blogs like Blogger and Wordpress became yet another “user-friendly” platform to build a website. And, let us not forget the ultimate in efficiency and utility, Facebook. Now anything longer than a one-minute video, a collection of any more than four of five pictures and certainly anything more than 20 words is too much to be bothered with, especially when the next item in the “newsfeed” will take only 3.4 seconds to consume. I have a list of links to blogs I used to frequent on a regular basis. The authors of those blogs would visit mine regularly as well. The Blogosphere was more of a Blogoverse with various discrete communities, or Blogospheres, populating it. Every different community had its own character and not unlike the real world, there was plenty of intersection amongst various different communities. After just now visiting those in my community, I have found that most have moved away - and many without a trace. A handful still have a presence on the Internet, their sites are still there, but they were left abandoned with no new activity for the past three, four, five or more years. Some left a “farewell” post with a forwarding address consisting of their Facebook profiles. Others indicate they have created new blogs, the links to which are equally dead. Some URLs are “for sale” and some forward to non-existent places or, weirder still, foreign language sites that have seemingly nothing to do with the URL or the name of the site. Squatters have taken over, or, perhaps it is the cyber equivalent of overgrown foliage taking over a once thriving homestead. For the most part, my old neighborhood is a ghost town. This is progress. I am as much a part of this mass migration away from this pivotal Internet building block as I was a contributor to its creation. My last post in this blog, The 25 Year Plan (now just shy of its 10th anniversary), was last June. Prior to that, I was more prolific than in recent years, but of the 550+ posts written since this blog’s inception, the vast majority were written in the first five years. I have not visited another blog on my “blogroll” (my “neighbors”) in many, many months, probably some years. And I cannot remember the last time I read a post or left a comment on someone else’s blog. Progress. For my part, I do not limit my Facebook presence to sound-bite sized posts, although many are. I remember where I came from, I value the power of the written word. In owe much to the Blogosphere and my neighbors there. Some moved to Facebook, too, and we are “friends” there. But I bet they would tell you it’s not the same. For many, it is difficult, perhaps even inconceivable to imagine that a platform such as Facebook will ever be relegated to an Internet ghost town. And maybe, just maybe Mark Zuckerberg found that perfect formula that will stand the test of time. I wouldn’t bet on it, though. Something different, probably even easier and faster than Facebook will come down the pike. It will probably, with the speed of technology today, happen even faster than anyone can predict. It will blindside us. 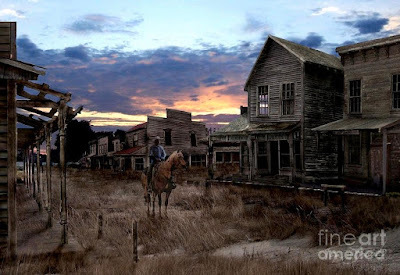 Many will find themselves wandering around the Facebook ghost town, much like the Myspace ghost towns today, wondering what happened. It’s progress.